When fashion designer Ralph Rucci saw the terrace of an empty apartment on New York City's Upper East Side some 13 years ago, he melted. He had asked his real estate agent to find him a place downtown, in the East Village. He was annoyed that instead she brought him to an 18th-floor penthouse just four blocks from his old place on Park Avenue. "I walked in—it was bare white walls—and then I went outside and saw the terrace, and I said, 'This is it.' "
That terrace is now his garden sanctuary. Rucci, an evangelist of elegance—one of only two Americans ever to be invited to show in Paris by the Chambre Syndicale de la Haute Couture Parisienne— often ends his long days there, collapsed on a white-cushioned chaise longue in a corner. Surrounded by greenery, he relaxes and reflects. In the summer, he sometimes falls asleep and spends the night there. In his aerie high above New York's streets, Rucci hears little of the city's noise. Unquestionably, Rucci's style and fashion sensibility can be seen in his garden. Lushness takes precedence over a profusion of color. All the planters are black, and soil is nowhere to be seen: It's covered by moss or black stones. Contrasting textures abound, provided by a dozen different kinds of trees: a spiky silver-blue pine juxtaposed with a feathery Japanese red maple; a weeping blue Atlas cedar, its branches conjuring up the heights and depths of a Chinese mountainscape screen, standing near three boxwood topiary balls. There are no flowers, just flowering trees—a pale pink weeping cherry centering a row of pines along one wall, white Japanese snowbells, or styrax, along another, and citrus trees (lemons, limes, and grapefruits) in a couple of places. "The scent of the trees, especially the Meyer lemon trees, is incredible," Rucci says. They are also very productive—he eats the fruit himself, but sometimes the harvest is so bountiful that he takes the surplus to his atelier. Last year, there were so many lemons that his employees were even making lemon curd. It took time for Rucci to find the right formula for turning the space into his personal Eden. The long, narrow passageway runs the length of his apartment and flows into a rectangle at the corner, forming an L-shape. At first, he placed huge palm trees. "They were torn apart over the winter," he says. Next, he tried white birch. "They had a short season, and were not strong enough." With help from landscape designer John Wysocki, he settled on the current arrangement, which has remained in place, with minor tweaks, about 10 years ago. Rucci gave Wysocki one word of direction: "chinoiserie." Then they collaborated on decisions. The garden sits at the end of the apartment's mirrored entry corridor, entered through a frosted glass door. Golden bamboo trees stand sentry. The terrace itself is almost an apartment—its spaces form four "rooms," anchored respectively by the chaise, a couch and chairs, another chaise, and, in the largest space, a wrought-iron glass-topped table. For dinner parties, the table is set with Baccarat crystal, Buccellati silver flatware, china—"I mix patterns," he says—and pure white linen napkins embroidered with pagodas. After dark, tiny bulbs strung in the trees and along the railings provide light. Here and there among the trees are treasures, mostly of Asian design, placed on a window sill, a tiny table, the red brick floor, arranged precisely, alone or in mini-tableaus. They are garden fixtures, but they correspond with the collection of Asian antiquities—Khmer, Chinese, Indian—that Rucci displays inside the apartment (along with a suite of works by Cy Twombly, for whom he named his eight-year-old English bulldog). Like his clothing, Rucci's garden is individualistic, even non-conformist; it has become the harmonious haven he envisioned all those years ago. Among the fashion cognoscenti, Ralph Rucci is seen as an artist, not merely a designer—and he looks the part. He usually dresses in black pants and a crisp, white tailored shirt and wears a trim beard. He credits the likes of Charles James, Madame Grès, Cristóbal Balenciaga, and Elsa Peretti as inspirations, but his creations are not an homage. Rucci's clothes are always original, as his many fashion awards attest. He says he's not creating fashion—which is fleeting—but style, which is timeless. He's also a notorious perfectionist, with his highly structured designs crafted from luxurious, often textured materials. The results are elegant, refined, classic. Rucci also paints and makes collages; his artworks have been exhibited in various galleries. 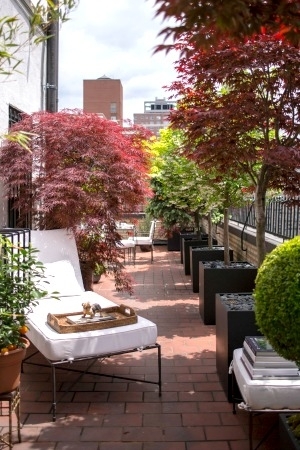 The designer surrounds himself with books, in the terrace garden as well as the apartment. And on the occasion of his 30th year in business a few years ago, he published a limited edition book, Autobiography of a Fashion Designer: Ralph Rucci, which consists largely of photographs; many are close-ups of objects in his apartment and elements of his fashions.